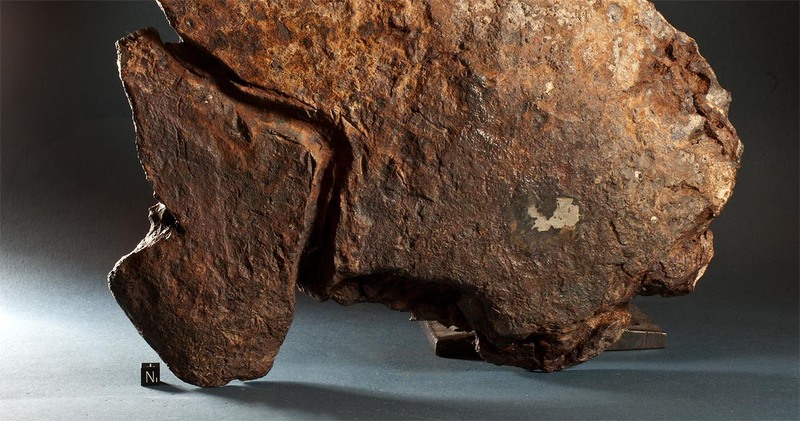 Buchwald also mentioned evidence for extensive reheating of several Gibeon specimens for a short period of time, probably as a result of local energy release during the violent atmospheric rupturing. 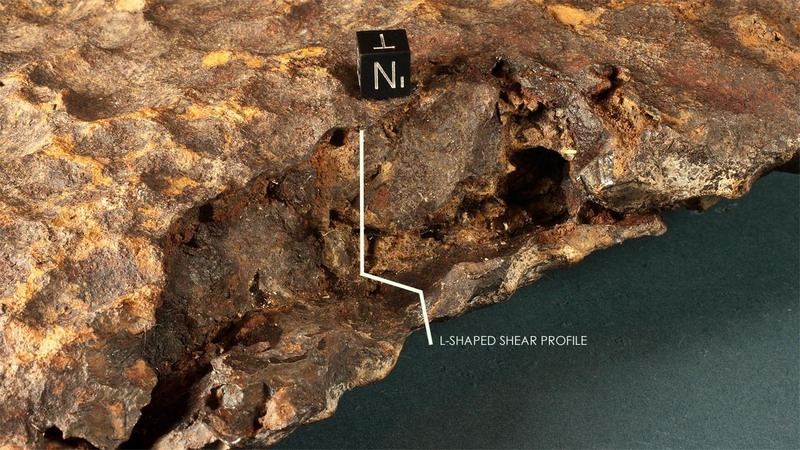 „It may be more than a coincidence that the most reheated specimens seem to come from the periphery of the strewn field and thus represent material thrown 100 – 200 km away from the central area.“ During the research for this article the author had the opportunity to acquire a previously undiscribed specimen of the Gibeon meteorite which provides additional evidence for a violent atmospherical break up of the Gibeon body. The specimen discussed here was found by Manfred Gollub on his farm between Maltahöhe and Gibeon in 1985 and sent to Germany under the name of its find location. (“Maltahöhe” is not a synonyme for Gibeon but a field name for an individual mass of the Gibeon fall. This Gibeon individual is not to be mixed up with the meteorite Maltahöhe, which is an IIICD iron (see also Meteoritical Bulletin, No. 71, p. 258)). With dimensions of 42 x 36 x 6.6 cm the meteorite forms a flat oval shield narrowing towards frayed edges. Due to the thin profile of the shield shape the Maltahöhe mass weighs only 29.96 kg. One slightly concave surface is completely covered with small regmaglypts which show an average extension of 2 cm and an average depth of ~1.2 cm. The regmaglypts are distributed in a random pattern rather than in a radial orientation. Their depth increases towards the centre of the concavity, which is located ~ 8 cm off the geometrical centre and on the expanded end of the shield. The other surface is slightly convex, and apart from a 15 cm long groove, shows little plastic sculpting. Opposite the concavity from the regmaglypted side the convex surface shows a narrow apex which also constitutes the centre of gravity of the mass. No obvious flight marks are visible on this surface other than the groove. Though no fusion crust is preserved, the overall erosion on the Maltahöhe mass can be considered as very moderate. Regmaglypts are still clearly defined, extension cracks show only superficial caving or smoothing and the common exaggeration of features as well as any sharp edges or spikes on either surface, which are usually attributed to soil etching, are absent. One third of the roughly oval fringe of the shield shows vaulting towards the regmaglypted side, most likely due to atmospheric ablation. The other two thirds are jagged shear surfaces clearly indicating a rupture of the fringe across a plane that was at least 4 – 5 cm thick. Short expansion cracks, wedge shaped clefts and two twisted peninsula shaped protrusions account for a violent fragmentation. Despite some degree of ablation on their edges all these features still show the jagged shrapnel like appearances which are characteristic to shear surfaces. All textures are only lightly overformed by flight ablation. It is interesting to note that along parts of the edge the rupture left a staircase shaped shear profile. Namely the parts which sheared off tore more material from the regmaglypted side of the shield than from the opposite flat side. This is perhaps an indication of an oriented flight at the time of the break up and may be treated as evidence for a temperature gradient and differences in the depth of heating between the two surfaces. It is nearby to assume that due to a higher degree of heating the leading surface offered a slightly higher coefficient of extension than the trailing surface and thus could be stretched further before the metal gave in. Evidence for atmospheric ablation subsequent to the break up is present in the shape of regmaglypts extended over the edges and onto the shear surfaces. One of the expansion cracks from the fringe continues on the flat surface where it shows extensive carving and widening into a channel like groove. The smoothness and uniformity with which the 3 mm crack has been extended to a depth and width of 12 x 12 mm as well as the absence of other exaggeration features on the specimen suggest a forming through atmospherical ablation rather than through terrestrial erosion. The Maltahöhe mass not only lends proof to the hypothesis of one or several violent atmospheric fragmentations of the Gibeon meteoroid but also delivers evidence for a continuing ablation of the falling bodies subsequent to this violent airburst. 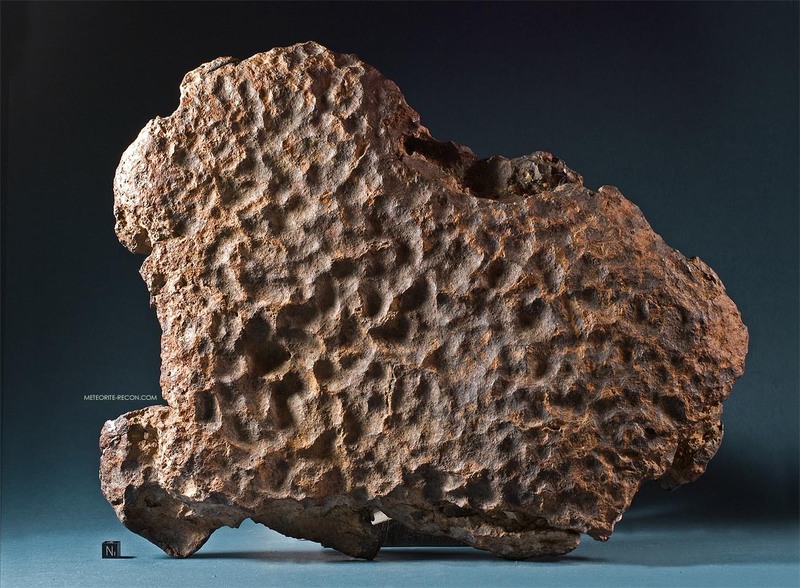 Judged by regular ablation rates of other iron meteorites (~ 0.2 cm/sec, Lovering et al. 1960) and by the depth to which the expansion crack was hollowed out, it may be presumed that the break up occurred early during the descent, allowing considerable ablation through the continuing supersonic plasma flux.